SPSP recognizes excellence in research by student members with its Student Publication Prize. Papers are eligible for consideration if they are published in the calendar year prior to nomination in Personality and Social Psychology Bulletin, Personality and Social Psychology Review, or Social Psychological and Personality Science. Recipients of this prize receive a $400 honorarium and an accompanying plaque, which is presented at the annual Awards Ceremony held at the SPSP Annual Convention, as well as a complimentary one-year SPSP membership. Eligible papers must have been published in PSPR, PSPB or SPPS during the calendar year prior to nomination. For example, to be nominated in 2017, the publication must have been printed in calendar year 2016. Papers and chapters still "in press" are not eligible. All student first-authored papers that have been accepted for publication in SPSP journals are automatically eligible for this prize. There is not an open call for nominations. For more information on the nomination process, see the Contact tab. The factors that allow people to be good support providers in relationships are not fully understood. We examined how support providers’ stressful experiences (financial strain and racial discrimination) differentially influence their supportiveness, using longitudinal data from two samples of African American couples. Among couples that provided observational data (N = 163 couples), providers who experienced high chronic financial strain behaved less supportively toward their partners, while those who experienced frequent racial discrimination behaved more supportively over a 2-year period. In a second sample of 213 couples over a 3-year period, support providers who experienced financial strain were perceived by their partners as slightly less supportive, while providers who experienced frequent racial discrimination were perceived by their partners as more supportive. Findings suggest that supportiveness in relationships may be differentially shaped by the specific stresses and strains that partners face. Although much research considers how individuals manage their own emotions, less is known about the emotional benefits of regulating the emotions of others. We examined this topic in a 3-week study of an online platform providing training and practice in the social regulation of emotion. We found that participants who engaged more by helping others (vs. sharing and receiving support for their own problems) showed greater decreases in depression, mediated by increased use of reappraisal in daily life. Moreover, social regulation messages with more other-focused language (i.e., second-person pronouns) were (a) more likely to elicit expressions of gratitude from recipients and (b) predictive of increased use of reappraisal over time for message composers, suggesting perspective-taking enhances the benefits of practicing social regulation. These findings unpack potential mechanisms of socially oriented training in emotion regulation and suggest that by helping others regulate, we may enhance our own regulatory skills and emotional well-being. Given the evolutionary significance of survival, the mind might be particularly sensitive (in terms of strength and speed of reaction) to stimuli that pose an immediate threat to physical harm. To rectify limitations in past research, we pilot-tested stimuli to obtain images that are threatening, nonthreatening-negative, positive, or neutral. Three studies revealed that participants (a) were faster to detect a threatening than nonthreatening-negative image when each was embedded among positive or neutral images, (b) oriented their initial gaze more frequently toward threatening than nonthreatening-negative, positive, or neutral images, and (c) evidenced larger startle-eyeblinks to threatening than to nonthreatening-negative, positive, or neutral images. Social-psychological implications for the mind’s sensitivity to threat are discussed. For decades, increasing intergroup contact has been the preferred method for improving cooperation between groups. However, even proponents of this approach acknowledge that intergroup contact may not be effective in the context of intractable conflicts. One question is whether anything can be done to increase the impact of intergroup contact on cooperation. In the present study, we tested whether changing perceptions of group malleability in a pre-encounter intervention could increase the degree of cooperation during contact encounters. Jewish and Palestinian-Israeli adolescents (N = 141) were randomly assigned either to a condition that taught that groups are malleable or to a coping, control condition. During a subsequent intergroup encounter, we used two behavioral tasks to estimate the levels of cooperation. Results indicated that relative to controls, participants in the group malleability condition showed enhanced cooperation. These findings suggest new avenues for enhancing the impact of contact in the context of intractable conflicts. Recognition has grown that moral behavior (e.g., generosity) plays a role in status attainment, yet it remains unclear how, why, and when demonstrating moral characteristics enhances status. Drawing on philosophy, anthropology, psychology, and organizational behavior, I critically review a third route to attaining status: virtue, and propose a moral virtue theory of status attainment to provide a generalized account of the role of morality in status attainment. The moral virtue theory posits that acts of virtue elicit feelings of warmth and admiration (for virtue), and willing deference, toward the virtuous actor. I further consider how the scope and priority of moralities and virtues endorsed by a moral community are bound by culture and social class to affect which moral characteristics enhance status. I end by outlining an agenda for future research into the role of virtue in status attainment. Priyanka D. Joshi: We introduce the construct of relational scope to refer to the degree to which an individual engages in communication with a more or less distant audience, with a contractive relational scope indicating a near audience and an expansive relational scope indicating a distant audience. Drawing on construal level theory, we argue that speakers use abstract messages strategically when faced with an expansive relational scope in order to be widely relevant and relatable. We show that speakers communicate more abstractly with distant others than near others (Studies 1–3) and experience greater fit when message framing matches audience distance (Study 4). We also demonstrate that framing messages abstractly prompts broader relational scope, with speakers more likely to direct concrete (abstract) messages to near (distal) audiences (Study 5). Finally, we show that when procedural information is critical to communication, communication with distant (vs. proximal) others will increasingly emphasize procedures over end states (Study 6). Joshi, P. D., Wakslak, C. J., Raj, M., & Trope, Y. (2016). Communicating with distant others: the functional use of abstraction. Social Psychological and Personality Science, 7(1), 37-44. Gabrielle Filip-Crawford: Negative behaviors targeting gay men and lesbians range from violent physical assault to casting a vote against gay marriage, with very different implications for those targeted. Existing accounts of such actions, however, are unable to differentially predict specific anti-gay behaviors, leaving a large theoretical hole in the literature and hindering the design of effective interventions. We propose (a) that many sexually prejudiced laypersons conceptualize homosexuality and pro-gay ideology as “contaminants” analogous to infectious pathogens and (b) that anti-gay behaviors can thus be viewed as strategic attempts to prevent, contain, treat, or eradicate the “pathogens” of homosexuality and pro-gay ideology. By considering analogues to disease-spread processes (e.g., susceptibility of specific subpopulations, inoculation procedures, prevalence in the local environment, interconnections among community members), we derive novel predictions regarding the incidence and nature of anti-gay behaviors and provide leverage for creating more tailored interventions to reduce such discrimination. Filip-Crawford, G., & Neuberg, S. L. (2016). Homosexuality and pro-gay ideology as pathogens? Implications of a disease-spread lay model for understanding anti-gay behaviors. Personality and social psychology review, 20(4), 332-364. Matthew D. Rocklage: Many situations in our lives require us to make relatively quick decisions as whether to approach or avoid a person or object, buy or pass on a product, or accept or reject an offer. These decisions are particularly difficult when there are both positive and negative aspects to the object. How do people go about navigating this conflict to come to a summary judgment? Using the Evaluative Lexicon (EL), we demonstrate across three studies, 7,700 attitude expressions, and nearly 50 different attitude objects that when positivity and negativity conflict, the valence that is based more on emotion is more likely to dominate. Furthermore, individuals are also more consistent in the expression of their univalent summary judgments when they involve greater emotionality. In sum, valence that is based on emotion tends to dominate when resolving ambivalence and also helps individuals to remain consistent when offering quick judgments. Rocklage, M. D., & Fazio, R. H. (2016). On the Dominance of Attitude Emotionality. Personality and Social Psychology Bulletin, 42(2), 259-270. Andrew H. Hales: Ostracism’s negative consequences have been widely documented, but research has yet to explore the personality characteristics of its targets that precipitate ostracism. Based on theories of the functions of ostracism, we found that people are more willing to ostracize disagreeable targets than more agreeable targets (Studies 2 and 3). This outcome was mediated by participants’ interpersonal trust toward the target, and was especially strong for people who highly endorse fairness as a foundation for morality (Study 4). Ironically, the experience of ostracism induced a state of disagreeableness: the very characteristic that elicits ostracism from others (Study 5). This relationship was mediated by feelings of anger (Study 6). Findings indicate disagreeableness is a particularly negative outcome of ostracism, because it leads to further ostracism. Hales, A. H., Kassner, M. P., Williams, K. D., & Graziano, W. G. (2016). Disagreeableness as a Cause and Consequence of Ostracism. Personality and Social Psychology Bulletin, 42(6), 782-797. Laura Van Berkel: Hierarchy and dominance are ubiquitous. Because social hierarchy is early learned and highly rehearsed, the value of hierarchy enjoys relative ease over competing egalitarian values. In six studies, we interfere with deliberate thinking and measure endorsement of hierarchy and egalitarianism. In Study 1, bar patrons’ blood alcohol content was correlated with hierarchy preference. In Study 2, cognitive load increased the authority/hierarchy moral foundation. In Study 3, low-effort thought instructions increased hierarchy endorsement and reduced equality endorsement. In Study 4, ego depletion increased hierarchy endorsement and caused a trend toward reduced equality endorsement. In Study 5, low-effort thought instructions increased endorsement of hierarchical attitudes among those with a sense of low personal power. In Study 6, participants’ thinking quickly allocated more resources to high-status groups. Across five operationalizations of impaired deliberative thought, hierarchy endorsement increased and egalitarianism receded. These data suggest hierarchy may persist in part because it has a psychological advantage. Van Berkel, L., Crandall, C. S., Eidelman, S., & Blanchar, J. C. (2015). Hierarchy, dominance, and deliberation: Egalitarian values require mental effort. Personality and Social Psychology Bulletin, 41(9), 1207-1222. Jonas R. Kunst: Although integration involves a process of mutual accommodation, the role of majority groups is often downplayed to passive tolerance, leaving immigrants with the sole responsibility for active integration. However, we show that common group identity can actively involve majority members in this process across five studies. Study 1 showed that common identity positively predicted support of integration efforts; Studies 2 and 3 extended these findings, showing that it also predicted real behavior such as monetary donations and volunteering. A decrease in modern racism mediated the relations across these studies, and Studies 4 and 5 further demonstrated that it indeed mediated these effects over and above acculturation expectations and color-blindness, which somewhat compromised integration efforts. Moreover, the last two studies also demonstrated that common, but not dual, groups motivated integration efforts. Common identity appears crucial for securing majorities’ altruistic efforts to integrate immigrants and, thus, for achieving functional multiculturalism. Kunst, J. R., Thomsen, L., Sam, D. L., & Berry, J. W. (2015). “We Are in This Together” Common Group Identity Predicts Majority Members’ Active Acculturation Efforts to Integrate Immigrants. Personality and Social Psychology Bulletin, 41(10), 1438-1453. Kun Zhao: Economic games are well-established experimental paradigms for modeling social decision making. A large body of literature has pointed to the heterogeneity of behavior within many of these games, which might be partly explained by broad interpersonal trait dispositions. Using the Big Five and HEXACO (Honesty-Humility, Emotionality, eXtraversion, Agreeableness, Conscientiousness, Openness to Experience) personality frameworks, we review the role of personality in two main classes of economic games: social dilemmas and bargaining games. This reveals an emerging role for Big Five agreeableness in promoting cooperative, egalitarian, and altruistic behaviors across several games, consistent with its core characteristic of maintaining harmonious interpersonal relations. The role for extraversion is less clear, which may reflect the divergent effects of its underlying agentic and affiliative motivational components. In addition, HEXACO honesty-humility and agreeableness may capture distinct aspects of prosocial behavior outside the bounds of the Five-Factor Model. Important considerations and directions for future studies are discussed within the emerging personality–economics interface. Zhao, K., & Smillie, L. D. (2015). The role of interpersonal traits in social decision making: Exploring sources of behavioral heterogeneity in economic games. Personality and Social Psychology Review, 19(3), 277-302. James R. Rae: The industrialized world is becoming more ethnically diverse. Research in several disciplines has suggested that exposure to racial out-groups may be associated with more positive and more negative intergroup attitudes. Given that U.S. states are often at the center of debate regarding diversity-related public policy, we examined how exposure to out-groups is associated with state-level implicit and explicit race bias among White and Black Americans. We found that larger proportions of Black residents across U.S. states were associated with stronger implicit and explicit in-group bias among both White and Black respondents. State-level bias was predicted by proportions of Black residents even when controlling for (a) state-level demographic control variables (e.g., median income), (b) proportions of non-Black minorities, and (c) historical membership in the Confederacy. Our results convey the importance of investigating why diversity may not always have the positive impact on intergroup relations that one might hope it to have. Rae, J. R., Newheiser, A. K., & Olson, K. R. (2015). Exposure to racial out-groups and implicit race bias in the United States. 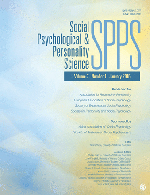 Social Psychological and Personality Science, 6(5), 535-543. Samantha J. Heintzelman: Heintzelman, S. J., & King, L. A. (2014). (The Feeling of) Meaning-as-Information. Personality and Social Psychology Review, 18, 153-167. Bo M. Winegard: Winegard, B. M., Reynolds, T., Baumeister, R. F., Winegard, B., & Maner, J. K. (2014). Grief functions as an honest indicator of commitment. Personality and Social Psychology Review, 18, 168-186. Jiyin Cao: Cao, J., Galinsky, A. D., & Maddux, W. W. (2014). Does travel broaden the mind? Breadth of foreign experiences increases generalized trust. Social Psychological and Personality Science, 5, 517-525. Alyssa Fu: Fu, A. S., & Markus, H. R. (2014). My mother and me: Why tiger mothers motivate Asian Americans but not European Americans. Personality and Social Psychology Bulletin, 40, 739-749. Samantha Joel: Samantha Joel, Amie M. Gordon, Emily A. Impett, Geoff MacDonald and Dacher Keltner (2013). The Things you do for me: Perceptions of a romantic partner’s investments promote gratitude and commitment. Personality and Social Psychology Bulletin, 39, 1333-1345. Kyle G. Ratner: Kyle G. Ratner, May Ling Halim, and David Amodio. Perceived stigmatization, ingroup pride, and immune and endocrine activity: Evidence from a community sample of Black and Latina women. (2013). Social Psychological and Personality Science, 4, 82- 91. Xiaowen Xu: Xiaowen Xu, Raymond A. Mar and Jordan B. Peterson (2013). Does cultural exposure partially explain the association between personality and political orientation?. Personality and Social Psychology Bulletin, 39, 1497-1517.